The BofE Quarterly Bulletin was released yesterday, and buried within the full report is an interesting section on the FX usage of non bank financial and non-financial segments. 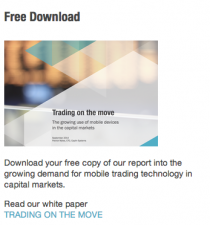 The report makes reference to data from the 2010 BIS FX Triennial survey some of which I have covered in my blog back in December, and touched on these findings as part of an analysis of etrading by single and multi dealer platforms. The report is actually well worth reading, as it brings together data from a number of complementary surveys to back its findings. Non Bank Financial Institutions: The majority of FX turnover reflects investors hedging currency risk associated with overseas investments. But there remains a significant amount of profit-seeking within foreign exchange markets, both by leveraged and non-leveraged investors. An increasingly important profit-seeking group of participants in recent years has been high-frequency traders, which have changed the dynamic of foreign exchange markets, with smaller trade sizes at a much more regular frequency. Non Financial Institutions: In contrast, non-financial companies almost entirely use foreign exchange markets to reduce the currency risk associated with their everyday business activities. The means by which they do so are varied and are, in part, related to accounting treatments. They typically use relatively simple, short-maturity foreign exchange instruments, although there is also some activity in options markets. Some interesting charts from the report are shown below. 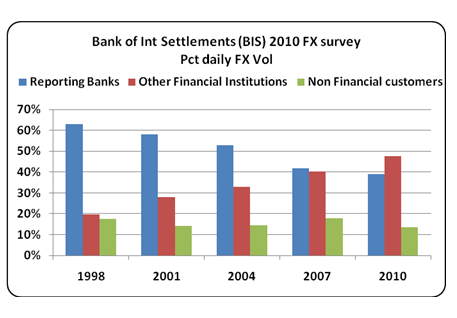 By way of background, most central banks, and the Bank of International Settlements (BIS) carry out FX volume surveys, which show FX trading volumes by end-user segments split into: Banks (Reporting Dealer & Other banks), Other Financial Institutions (leveraged funds, asset managers, etc) and Non Financial Institutions (corporate clients). As expected, the larger the company, the more likely they are to have an FX hedging strategy in place, as shown in the chart below. 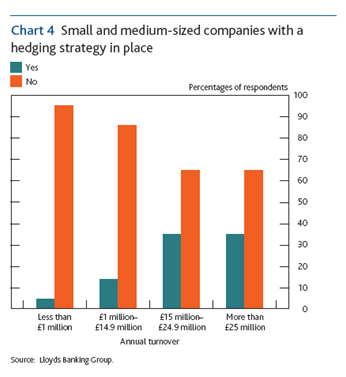 Note that according to the Lloyds Bank 2010 survey, just over 30% of SMEs with turnover greater than £25mln have an FX hedging policy in place, this contrasts to over 88% of large Global Multinationals (2010 Risk magazine Survey). With regard to corporate heding policy, a gtnews report (gtnews 2011 Treasury Risk Management Survey) shows that 20% of all corporates surveyed have no hedging policy at all and well over a third of corporates in CEE & Latam also have no hedging policy.